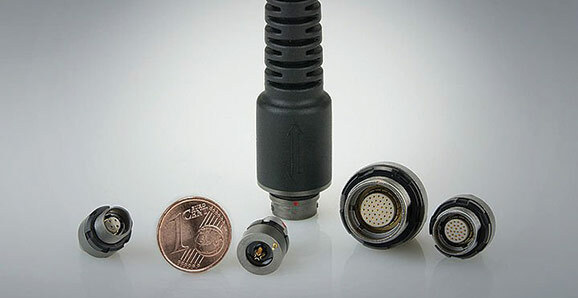 ODU AMC connector solutions find many applications within C4ISTAR systems that require significant weight and space reduction. This is absolutely crucial particularly for the soldier with field radios, portable computers, night vision, digital scopes, GPS antennas and soldier control units, and also for equipment such as UAVs, airborne vehicles, navigation modules and even more. Designed especially for military and security technology, this extremely robust metal circular connector series satisfies every demand when it comes to loading capacity and transfer reliability. The ODU AMC is in its element even under the most extreme conditions: tough, watertight and easy to clean even in the field. The low weight, low-reflection surface, excellent EMC properties and compact construction make these connections ideal elements for military and security technology. ODU also provides turn-key solutions that include complete advanced cable assembly and overmolding. With its Push-Pull design, the ODU AMC Push-Pull can be swiftly mated without force and unmated quickly – and you can do both blind, without needing to see the connector. The locking state is unambiguous and reliable even in hard-to-access places. The ODU AMC with Break-Away function was designed for connections that can be mated or demated in seconds, even under field conditions. One pull on the cable is enough to demate the connection. Naturally the plug can be mated again just as quickly. ODU AMC offers flexibility for all system engineers and hardware designers. The Push-Pull and Break-Away versions are interoperable, using the same receptacle and in-line receptacle. This way the cable can be changed later without modifying the receptacle (housing). The equipment designer has options. 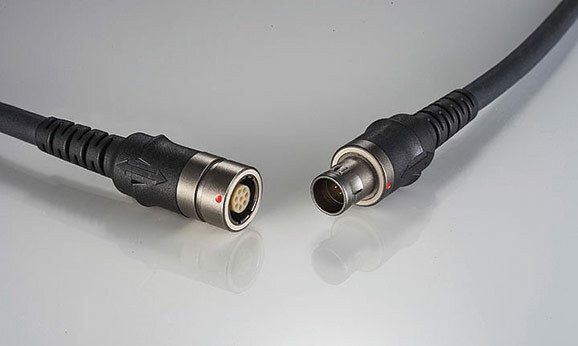 No matter how harsh the environment, whether exposed to snow, mud or dust, the Easy-Clean capability of these connector solutions enables high performance and high usability. The unique spring loaded pin system and the design of the connector meet all the stringent requirements of the most challenging environments. 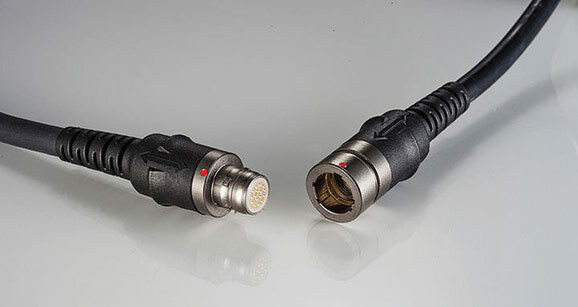 High-Density connectors provide the highest possible number of contacts in the most compact space. It gives developers new possibilities and solutions, whilst simultaneously challenging the manufacturer - because the connectors’ reliability and electrical & mechanical robustness must remain intact despite the compact size. Starting with a diameter of under 10 mm and going up to 18.5 with 40 contacts, the ODU AMC High-Density series proves that premium quality can also come in small packages. In addition to the High-Density signal connector, the range also includes versions for “Power” (up to 15 A) and Data Transfer in the most compact space. In military and security technology, ODU offers not only first class quality connections such as the ODU AMC, but also the complete assembly of the customer’s system solution. As a specialist in connection systems, ODU develops solutions matching the exact requirements and specifications that the market demands. Working in partnership with its customers, ODU creates the connection system that is needed for the application, resulting in a solution that is both technically and economically sound. Diverse connection solutions for a broad range of tasks: whether for transferring power, signals, data or media – when the demand is for perfect quality and absolute reliability ODU always delivers. When innovative applications call for new solutions in connection technology we provide the connection you need, tailored to your requirements – we can also offer a complete system, including cable assembly, from a single source. As specialists in the development and manufacture of connections with turned and stamped contacts, ODU combines all the relevant vital skills in one company. The ODU Group is one of the world’s leading suppliers of connector systems, employing 1,900 people around the world. In addition to its company headquarters in Mühldorf am Inn, Germany, ODU also has production sites in Sibiu/Romania, Camarillo/USA, Shanghai/China and Tijuana/Mexico, supported by an inter¬national distribution network. ODU combines all relevant areas of expertise and key technologies including design and development, machine tooling and special machine construction, injection, stamping, turning, surface technology, assembly and cable assembly.